With an aerodynamic body structure and modified features, its exteriors look quite attractive. Its side profile is defined by visible character lines. The door handles and outside rear view mirrors (integrated with side turn blinker) are painted in body color. Its flared up wheel arches are fitted with a set of 14-inch steel wheels, which have full wheel covers and are covered with 175/70 R14 sized tubeless tyres . The front fascia is designed with a well designed radiator grille with grey finish and it is embedded with a prominent chrome plated company’s insignia. This grille is flanked by a radiant headlight cluster that is integrated with high intensity halogen lamps and side turn indicator. Its body colored bumper has a wide air intake section for cooling the engine. The windscreen is made of green tinted glass and is integrated with a pair of intermittent wipers. The rear end is elegantly designed with stylish tail light cluster, body colored bumper with a pair of reflectors and an expressive boot lid, which is embossed with variant badging. The windshield is integrated with a high mounted stop lamp that adds to the safety aspect. This hatchback is designed with an overall length of 3775mm, a total width of 1695mm and a decent height of 1510mm. It has a large wheelbase of 2465mm and a minimum ground clearance of 170mm. With the exteriors done and dusted, let’s check what the Etios Liva has to offer once you step inside the cabin. In all honestly, there is not much. You continue to get the same simplistic and basic cabin layout, which is a bit of a turn-off as there was indeed quite a lot of scope for improvement. First its the steering wheel, which ergonomically feels a bit to large to handle; however it does get mounted controls for the 2-din music system. Talking about the music system, this piece in itself feels outdated, especially if you were to compare it with the ones available on the competition. The dial for operating the air-con control module are very basic while the ones for door locks, exterior mirror adjustment and headlamp leveling feel a bit awkwardly placed. With the update, Toyota has now revamped the centrally mounted instrument cluster and now it gets a digital tachometer, in addition to the back-lit speedometer, which now looks significantly better than the earlier one. Ergonomically, the Etios Liva’s cabin offers decent storage space, comfortable seats with good shoulder and under thigh support. To sum it up, the interiors of the Etios Liva are a love it or hate it affair, they have been designed not to look good but to work well, which they will for sure. 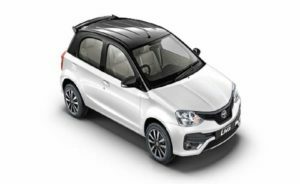 There was a lot of talk of the Liva getting the big 1.5-litre engine from the sedan, but anyone who knows the Indian market would know that the hatch would be looking to exploit the maximum benefits of the excise duty concessions that the Indian government has on offer for small cars. That means that under the Etios Liva hood is a 1.2-litre four-cylinder engine (Read :Engine & Transmission). On paper, it isn’t all that bad, 80PS @ 5600rpm and 104Nm @ 3100rpm. In fact the figures are pretty close to most of the competition and better than some as well. Coupled with the Liva’s approximately 900 kg kerb weight, it should also make for a great power-to-weight ratio to score high on performance. But somehow, that’s not the case because the Etios LIVA’s brief seems to be rather straight forward – better efficiency. With the gear ratios matched to make life in the city easier, the car does feel peppy enough at low revs and accelerates cleanly off the line, but the excitement tapers off much too soon and you really need to work the engine to get past 120km/h. Our instrumented tests did see the car cross the 150km/h mark but it took a lot of patience and even more stretches of empty roads to get there. The 5-speed manual gearbox may be the culprit here with gear ratios more conducive for city driving rather than highway cruising. But that does have a rather positive effect on its fuel efficiency. The ARAI certified stat reads 18.3kmpl cumulative but real world conditions should see you get about 14.3kmpl in the city and 16.1kmpl on the highway. Considering the prices of petrol today, that’s a welcome proposition indeed! All through the test, the Liva’s gearbox provided positive feel and slick shifts all the way to fifth. Predictably, the Liva didn’t scorch the acceleration runs, taking over 17 seconds to cross the 100km/h mark. What impresses most is the steering. We realized a turning circle radius of 4.8M, which means taking the car out from narrow spaces will never be a problem. Changing gears is very smooth and one can easily change gears while driving. The car’s ride is very smooth and comfortable. The Toyota Etios Liva’s AC is good and powerful and one could feel the effectiveness of the same quickly after turning it on. One more point here is that the glove box is also provided with blower inputs and hence cooling takes place in glove box, making it a good storage for things like chocolates, cool drink bottles etc. Also cup holders have been provided in each door and near the dash which adds to comfort as expected from a premium hatch. Major humps in the road are overcome with comfort thanks to the high quality suspension. There was no discomfort after the front wheels crossed hump, and there was enough ground clearance to clear the humps without scraping the ground.The car’s pick up is good and we could reach 60 to 80KMPH easily and smoothly in city traffic. While we pushed the car, we were able to touch 150 on the highways. The positioning of Instrument cluster in the middle though innovative, makes it difficult to gauge the speed of the car.Parking of the Etios Liva was easy and we could confidently park the car with minimum space for turning the car. Toyota has taken care of the safety of the passengers inside and a s a result they actually have loaded the LIva hatchback with ABS and EBD which comes as standard across all its grades. Furthermore the hatch also gets duel front SRS airbags as well. There is also an optional rear parking sensors as well with the car.